Three horizontal stripes of yellow, green and yellow in the proportions 1:3:1 with a white orange flower which is offset from the center towards the hoist. Yellow stands for happiness, green for peace and white for simplicity and purity. Adopted 1952-05-05. Yellow-green-yellow field with a flower emblem in white and yellow set towards the hoist on the green panel. Proportions 2:3. 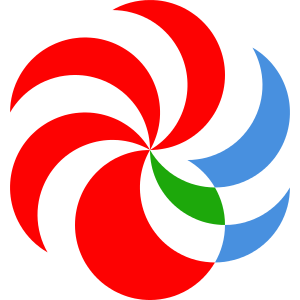 The prefecture emblem was adopted on Nov 1st 1989 which is red, green and blue three color emblem and used in the previous prefecture flag. The previous prefecture flag was adopted on Nov 1st 1989 which was white flag with red, green and blue three color prefecture emblem in the center. The emblem was swirling form and red stands for the sun, the prefecture flower orange, green for Mt. Ishizuchi and blue for Seto Inland Sea. The flag was abolished on May 31st 1999 and then the 1952 adopted prefecture striped flag was re-adopted and still in use.